Caroline Hands is a full time visual artist who works in painting, drawing, textile, batiks, feltmaking, copper and enamel, mosaic, 3D, photography, book illustration and many other mediums. Caroline has always travelled – her camera catching a wealth of images from all over the world which now forms a large archive of visual material. She has been visiting China since 2006. The generosity and kindness of her many Chinese friends and acquaintances has changed her life and fed her work enormously. From the age of dot she painted, drew and made shelters and sculptures out of products from the natural environment. 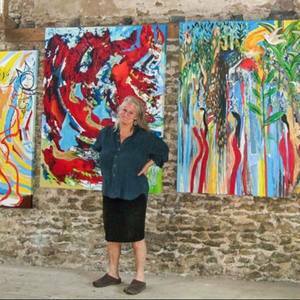 As a full time artist, Caroline’s work continues to develop and expand. Her work explores the diversity and richness of different cultures. Work/paintings of movement, humour and dance bridge between East and West and changing times. She went to Art College in London in the 1960s. After a start in a fashion course, making copper foil wigs amongst other things, she pursued a mixed media course of her own – theatre design, photography, sculpture, general visual research. This was before mixed media courses were common place. She completed a fine art painting degree course later. She also worked a great deal in community arts in London and the West Midlands. 2014 : during the last year Caroline after many years in the country has moved back to London. An enormous job moving a large studio contents ! She is happy to be back amongst the enormous cultural mix which always feeds her work heart and soul. Group exhibition at no format gallery. group exhibition, The Brick Lane Gallery. First Choice Gallery, National Trust, Stourhead, Wilts. Paintings/Drawings. Celebration of Arts Education in Worcestershire – The Malvern Hills Tapestry work with 6 Malvern Schools making large multimedia hanging that later hung in the reception at County Hall Worcester. Hyde Park Gallery, London, Large Multimedia Drawings. Hereford City Art Gallery, Paintings/Drawings/Textiles. Swan Hotel, Hay on Wye, Sunday Times Festival of Literature, Paintings/Drawings. Wormelow, Hereford. Batik Hangings used for backgrounds for African Music Concerts. Hereford Museum and Art Gallery. Batiks/Drawings/Paintings.